This November, there will be a question (#3) on the Massachusetts ballot that will ask us whether or not we want to uphold protections for transgender people in public places. These protections became law in 2016, and because of them, it is illegal for trans people to face discrimination in places like restaurants, medical offices, and hospitals. Most significantly, this means that transgender people have the legal right to use the restroom that corresponds to their gender in public places. Surprisingly, many Massachusetts voters want to repeal these protections- as many as 40%. They cite a concern about bathroom safety: a man could pretend to be a woman, and enter a woman's bathroom and do harm. Although there has been no uptick in safety incidents since the law came into effect, nor have there been any safety upticks in any of the municipalities that had a similar ordinance in place before the state law came into effect (Boston, for example), many people are swayed by this argument. What this means is that those of us in support of trans justice and equality must commit to vote YES on 3 in November and urge others to do so. You can make this commitment to vote YES on 3 by signing onto Keshet's Jewish Community Vote YES on 3 Pledge, and sending it to others you know in MA Jewish community. Interested in learning more about this issue? Visit the Keshet website or the Freedom for All Massachusetts- Yes on 3 website. the winter shelter program sponsored by our island faith communities, is looking for new adult volunteers. There are two shifts of two volunteers every night. You can sign up for shifts with friends. You can sign up for one night a week, or one night a month. It is easy and it is TRANSFORMATIVE! Everyone must attend ONE information session. Please write “Houses of Grace” on the memo line. ​Please distribute the literature that can be found in the MVHC lobby to your friends and acquaintances in the immigrant communities. Click here to see a video of the Symposium ! We have recently reactivated the MVHC Green Team and are looking for members who are interested in projects related to reducing energy usage, increasing recycling and reducing waste at our facility. Please contact Paul Rashba at 914-474-9787 if you are interested in joining this effort. Join the MVHC Social Action Committee ! Help to feed the hungry by filling the purple box in the lobby with nonperishable food items. The Island Food Pantry is now also accepting donations of Gift Cards to Stop&Shop, for more flexible help for families in need. ​If you do not have enough food, please note that the Island Food Pantry can now offer grocery store Gift Cards, in addition to their stock of boxed and canned foods. Gleaning - Food waste is a huge problem nationwide - 40-50% of the food we grow is never eaten. On the island we have at least 20,000 pounds of potential crop waste each year. Every week a group of volunteers meets at one of our participating farms and helps to carefully pick, and pack up that week's crop. Our generous island farms share surplus such as lettuce, bok choi, zucchini, apples, potatoes, and squash, which are then delivered free of charge around the island to those who need it. Since we rely on volunteers to do this important work, please contact Jamie if you're willing and able to help, and be sure to follow us on Facebook for harvest alerts. To volunteer, see the web site for Island Grown Initiative's Gleaning program here, or contact Jamie O'Gorman at jamie@islandgrown.org. The Social Action Committee's Racial Justice Project explores ways to be effective allies in eliminating racism and in making our Hebrew Center fully welcoming of diversity. See our new web page, under the "Community" tab on the MVHC web site. Here is the direct link. 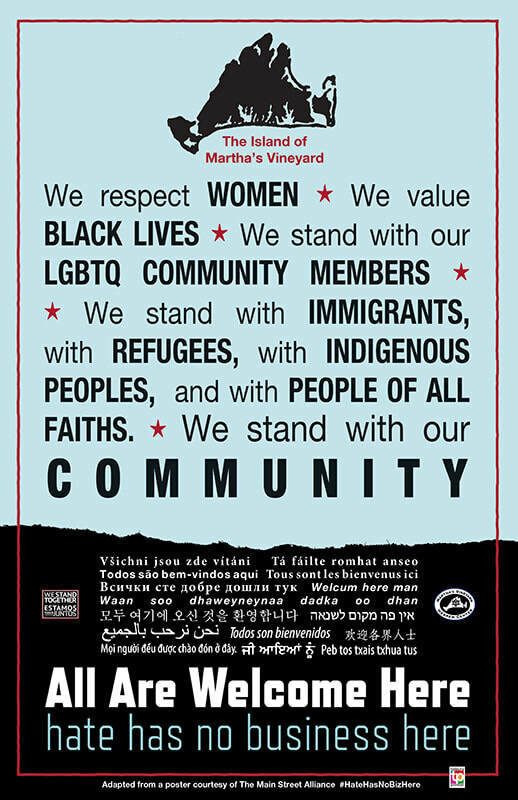 We Stand Together Martha's Vineyard is an ongoing social action organizing effort that meets on Tuesdays at 6:00 to 7:30 pm at the West Tisbury library. To learn more, attend a meeting or see their Facebook page. "... as an evolving and energized grass-roots group that is driven to protect our most vulnerable people on-island and off by educating ourselves in civics, actively engaging with local and state appointees and elected officials, voicing and protesting the continued rise of hatred, and becoming activists, thus growing awareness of and interaction with our political leadership on both sides of the aisle. Our mission is to educate ourselves, to reach out and understand our changing culture, and to unite and organize as a community. " Visit the African American Heritage Trail on the Vineyard ! Explore the new National Museum of African American History and Culture here! ﻿﻿The Social Action Committee﻿﻿ would like to thank the following volunteers who assisted the pilot program of the Summer Food Service Program this summer. This program supplied lunches to children throughout the island. Volunteers helped package lunches and distribute them to hungry children. Their efforts are to be lauded and appreciated, many thanks.